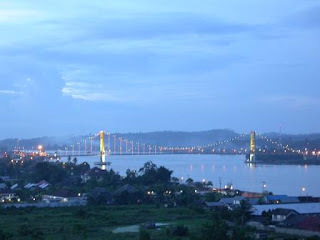 Tenggarong, up to Mahakam river from Samarinda, is the capital of Kutai regency and was once the seat of the Kutai sultanate. The Sultan’s palace at the riverside is now a museum where the old royal paraphernalia are kept, as well as an excellent collection of antique Chinese ceramics. Dayak statues can be admired in the yard. A curious thing about the royal paraphernalia is that they display a strong resamblance with Java’s court traditions. Every 24th of September, the former palace becomes a stage of dance and music performances given to celebrate the town’s anniversary.